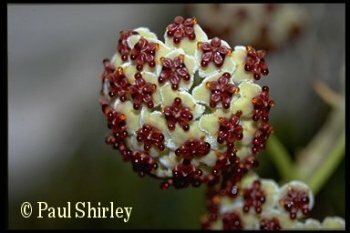 Hoyas A-M - De website van paulshirleysucculents! 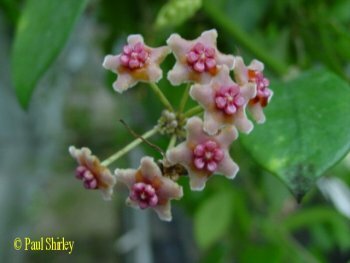 This tropical asclepiad originates from South-America and is now widespread in most (sub-)tropical regions of the world, such as Spain. It is both drought-tolerant and the opposite; it can take plenty of rain. 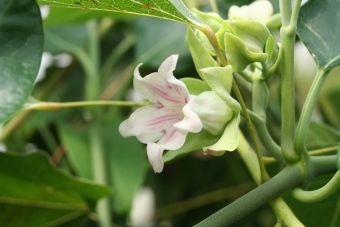 It is a climbing plant that can grow to up to 5-10 metres high. In some countries it is now considered to be a weed, but it is nevertheless a highly ornamental plant, producing pink-striped white flowered. See blog for more information. 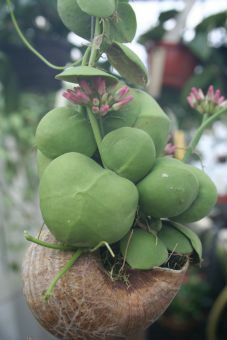 Dischidia nummularia comes from South-East Asia and is an epiphyte, growing on the tree trunks. 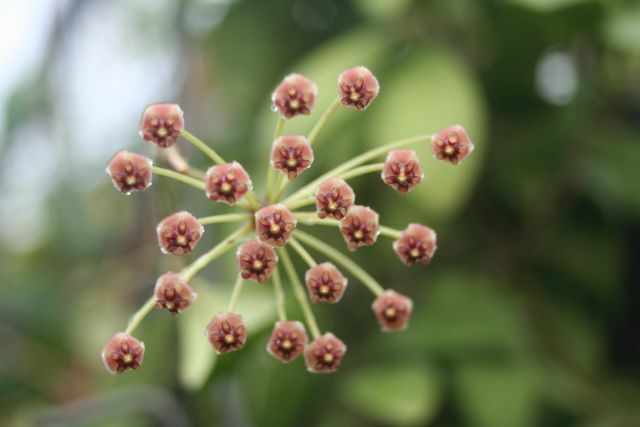 Because the flowers are small and often appear well above head height, they are difficult to spot. It likes plenty of light to grow well and if you are lucky you will get flowers, but it may take a while. 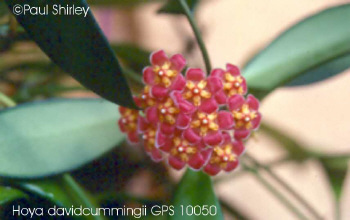 It is an untidy grower and likes plenty of space. The plants can be grown in either a compost mixture or on a piece of bark or similar medium. 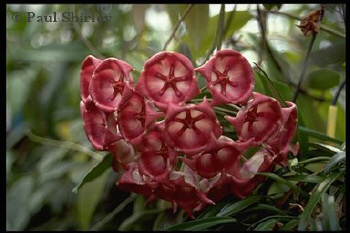 Generally speaking, dischidias prefer a higher temperature than hoyas, but grow quite well in the same temperatures as hoyas. 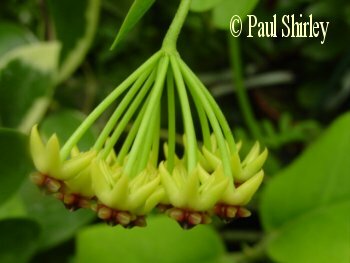 This species comes from the cool mountain forests of Birma. 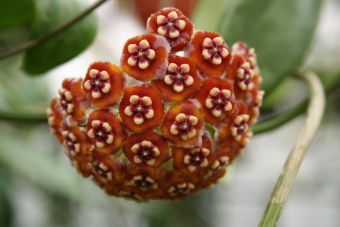 It is a well-known plant in cultivation, but many people still have problems growing this plant. The reason is that they keep it too warm. In the past our houses had the perfect climate for the plant, but since the invasion of the central heating, conditions have deteriorated (all this from the plant’s point of view, not from ours). So, if you want to grow this plant successfully, keep it cool, between 10 and 15° C.
Brevialata can be grown in shade or almost full sun. 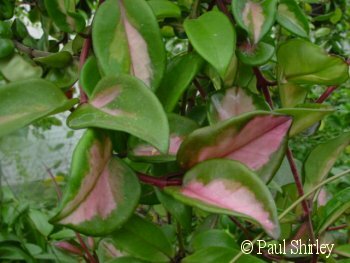 The leaves will turn a reddish colour if the plant is kept in the sun. 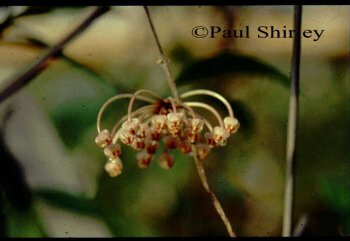 It flowers very freely and can surprise you with seedpods in the autumn as it is easily pollinated by moths. See blog for more information. 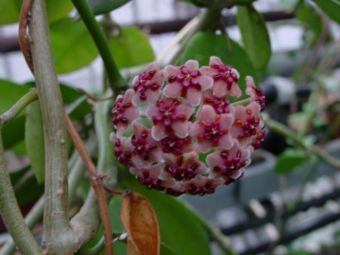 This is a sport obtained from Hoya carnosa. The leaves are curled up and hence the name Crinkle 8. 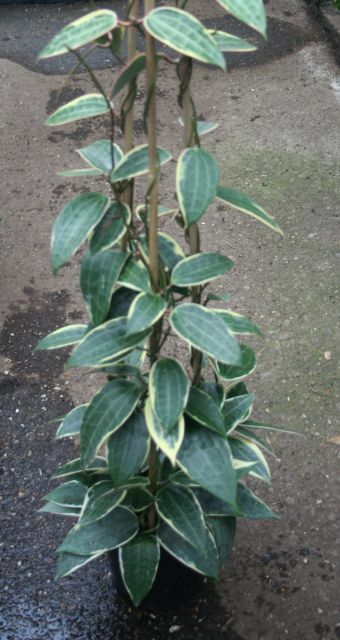 It is found in both green and variegated forms. 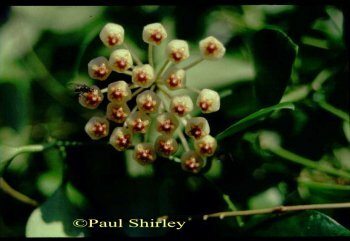 The flowers are the normal carnosa flowers. 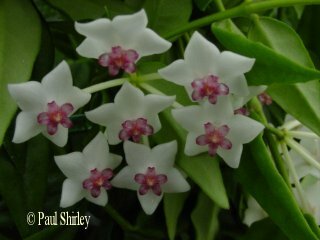 This Hoya species comes from the Philippines and is quite rare in the wild. 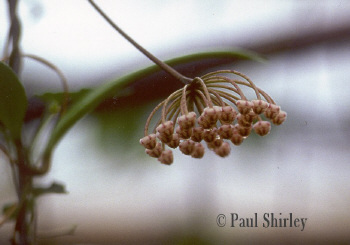 It flowers regularly throughout the year with umbels of about 10-15 flowers, but they are not scented. 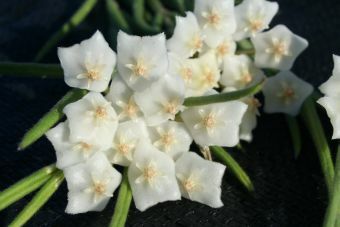 The plant is easy to propagate by cuttings and can flower the following year. See blog for more information. 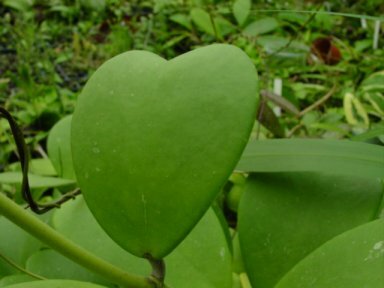 This species is becoming well known now because of the heart-shaped leaf which make it an ideal gift for Valentine's day. 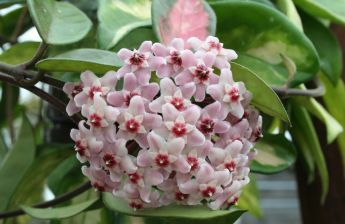 It is sold as the Sweetheart or Valentine's hoya. 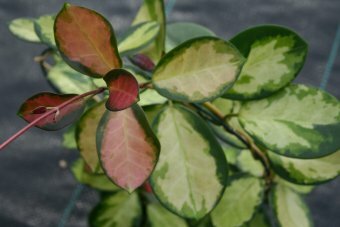 There are are at least 3 types: a green one, a variegated one and an albo-marginata type. They are found throughout the Indo-China area. This is a very popular plant in cultivation, because it is very easy to grow and flowers regularly throughout the year with cream-coloured flowers. 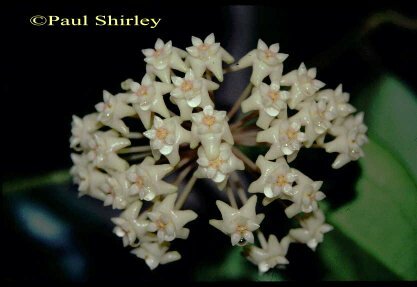 The flowers are highly scented to attract moths for pollination. 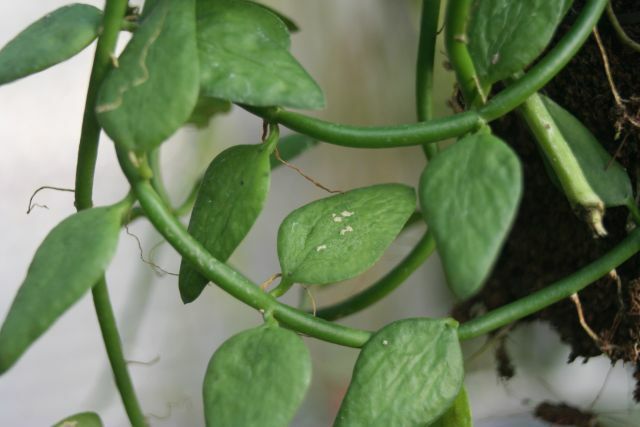 It is a suitable plant for hanging baskets where it will grow to 1-2 metres. It can also be grown on a trellis, but it has to be fastened up. It can best be grown in half shade, but it will tolerate some sun. 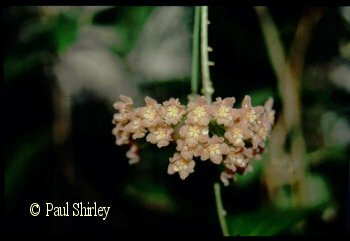 Lacunosa has many variations in leaves and flowers and hence a lot of cultivar names are used for the same species. 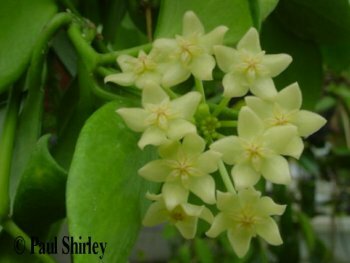 The plant originally comes from Java, Malaysia and Thailand and therefore likes a lot of warmth (at least 20°C) to do well. It does well in the ordinary living room as long as you keep it well-watered. 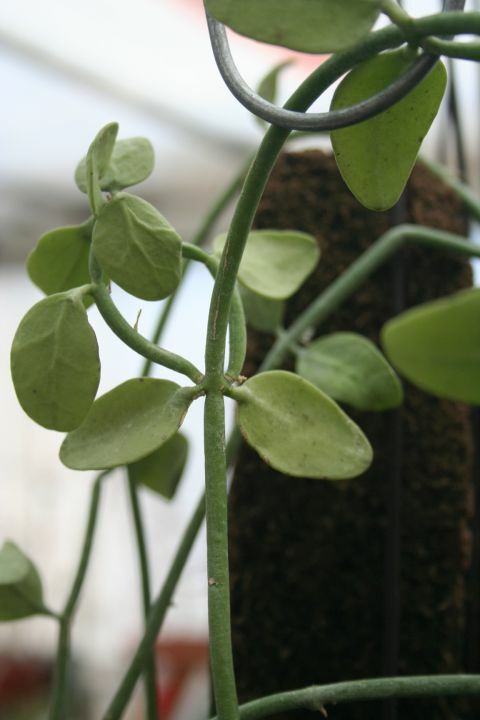 It is very easy to propagate from cuttings and also by seed as long as moths have access to the plant. 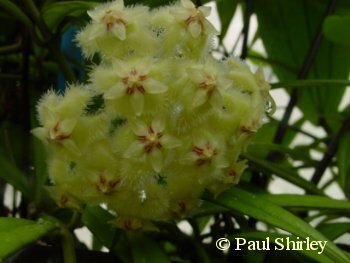 This unusual species is found in India and Burma. It is one of the few hoyas that just hangs. 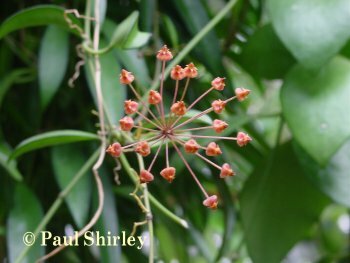 Many so called hanging hoyas also climb, but not this species. 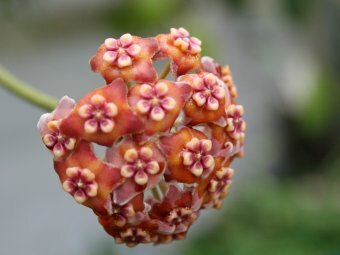 Like Hoya bella it can be difficult to grow. 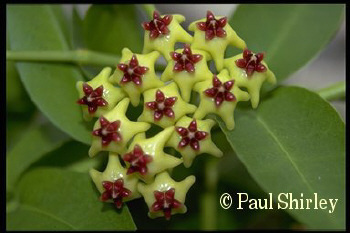 A species from the Philippines. 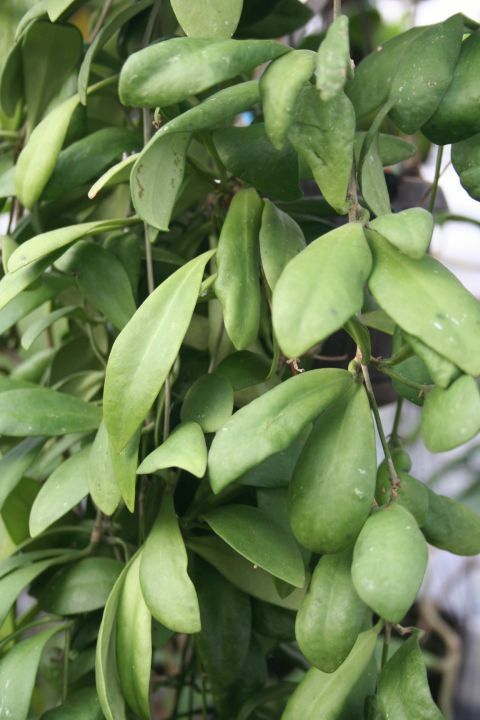 A good hanging plant with long, thin leaves. 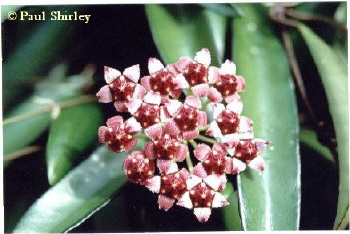 It is somewhat similar to H. kentiana, but without the red-green edge to the leaf. 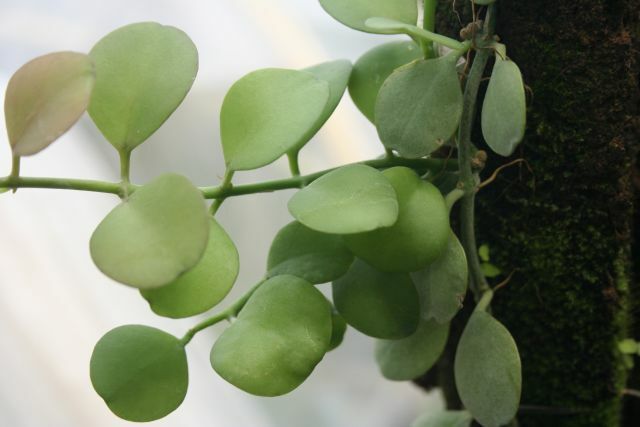 The leaves can be up to 8 cm long and 1.5 cm wide and have a tendency to stand upright. The leaf will also curl lengthways giving it a canoe appearance. The plant needs to be fairly old before it will flower. 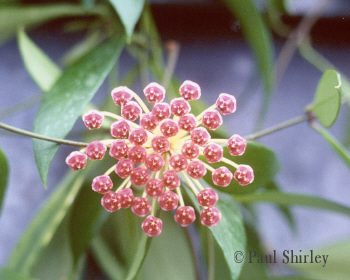 The flowers are reddish-orange and reasonably small. For some reason which I cannot explain, it tends not to be attacked by insects such as mealy bug or red spider mite. The plant can take a lot of heat and dryness. On the other hand, it can take a lot of water, but only up to a point. You can overwater it, so be careful. 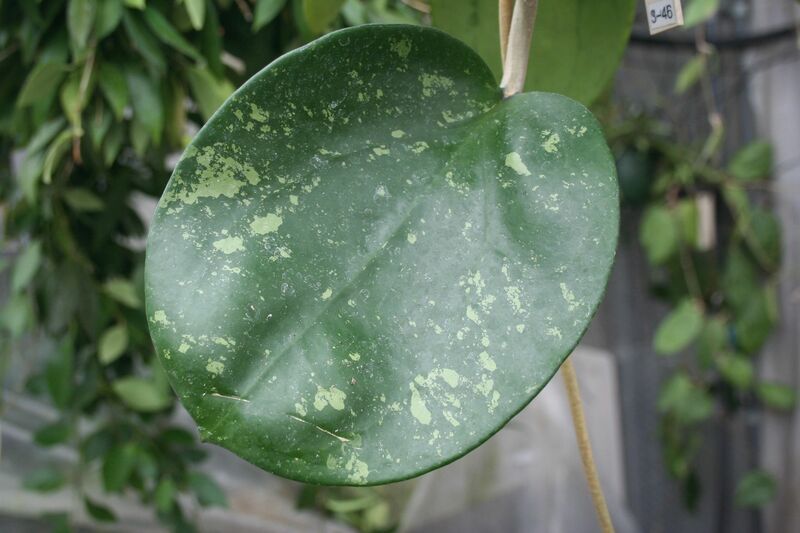 A climbing species from Thailand with thick glossy leaves. 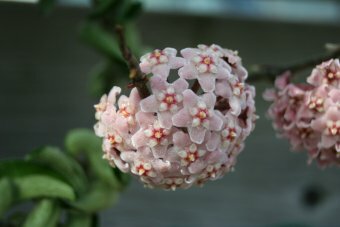 It can, when not in flower, be mistaken for H fraterna. 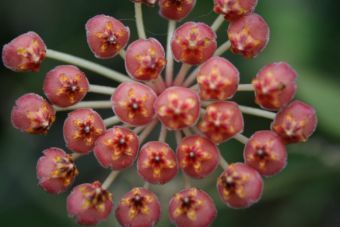 Some hoyas can take sun and will take on a nice reddish colour on the leaves, but this species will burn if put into sunlight or even in lightly shaded conditions. Keep it in a well-shaded place to avoid this problem. 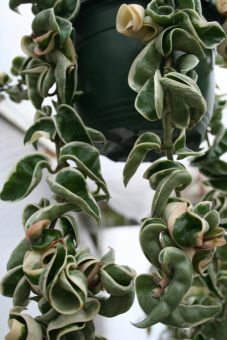 A hanging basket species with long thin leaves, heavily flecked with silver-grey markings. 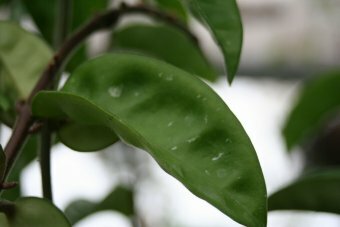 The leaves are up to 10 cm long and 2.5 cm wide. It grows and flowers very well indeed. A species from the Philppines. 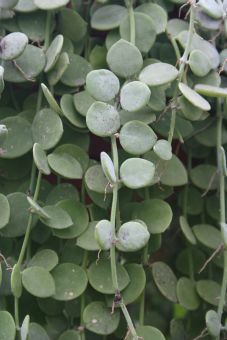 It has thick leathery leaves which are occasionally flecked with silver-grey. It makes a nice hanging plant. The flowers don't stand out.